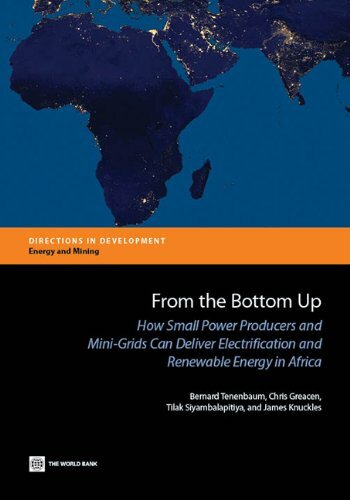 Chris Greacen (MS,’97 & PhD,’04) co-authored the book, “From the bottom up : how small power producers and mini-grids can deliver electrification and renewable energy in Africa,” recently published by the World Bank. Most Sub-Saharan African countries try to promote rural electrification through both centralized and decentralized approaches. This guide focuses on the decentralized approach, providing practical guidance on how small power producers and mini-grid operators can deliver both electrification and renewable energy in rural areas. It describes four basic types of on- and off-grid small power producers, as well as several hybrid combinations that are emerging in Africa and elsewhere. The guide highlights the ground-level regulatory and policy questions that must be answered by electricity regulators, rural energy agencies, and ministries to promote commercially sustainable investments by private operators and community organizations. Among the practical questions addressed is how to design and implement retail tariffs, quality of service standards, feed-in tariffs, and backup tariffs. The guide also analyzes the regulatory implementation issues triggered by donor grants and so-called top-up payments. It provides a primer for nonengineers on interconnection and operating standards for small power producers connected to main grids and isolated mini-grids. It analyzes whether the option of small power distributors, used widely in Asia, could be employed in Sub-Saharan Africa, and addresses two often ignored questions: what to do ‘when the big grid connects to the little grid’ and how to practice light-handed regulation. Finally, the guide considers the threshold question of when to regulate and when to deregulate tariffs. All these implementation issues are presented with specific ground-level options and recommendations rather than just general pronouncements. In addition, to make the discussion more useful to practitioners, the guide provides numerous real-world examples of successful and unsuccessful regulatory and policy actions taken in Kenya, South Africa, and Tanzania, as well as Nepal, Sri Lanka, and Thailand. Many of the decisions are inherently controversial because they directly affect the economic interests of investors and consumers. The guide highlights rather than hides these real-world controversies by drawing upon candid comments of key stakeholders—national utility managers, mini-grid operators, government officials, and and consumers. Also available from the World Bank.